WWII Airplane Spotter Playing Flash Cards | BUDK.com - Knives & Swords At The Lowest Prices! Each card has an aircraft name and 3 views of each aircraft. There is a mixture of friendly and enemy aircraft included. They also have regular playing card indexes so you can play your favorite card game. 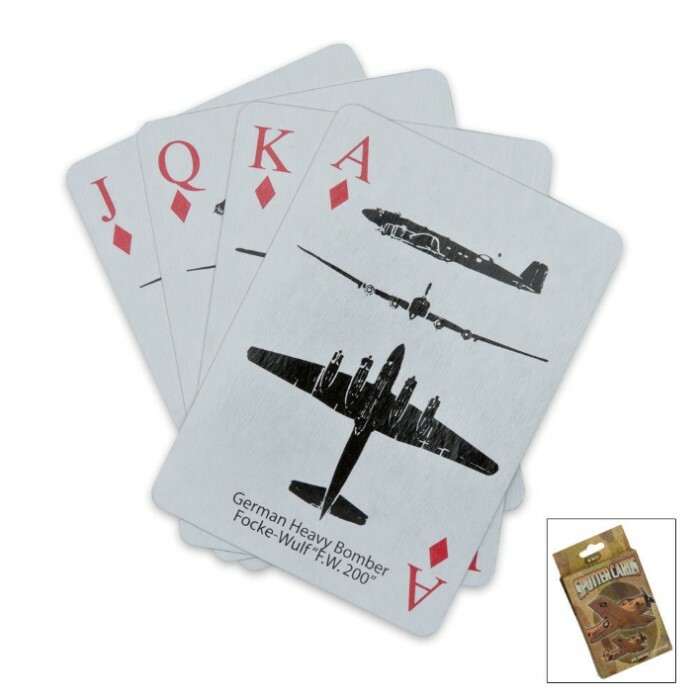 The WWII Airplane Spotter Playing Flash Cards are good waterproof cards they are plastic covered, and the planes that are in the deck are all real. Great cool stocking stuffer for Christmas or a Birthday. i loved them, i got them as a gift for my friend who does alot of card tricks and people love them and he did as well so win win! The cards are of a pretty decent quality. I don't think its Casino grade cards, but just for casual card games with friends they work. they're also pretty slick, plastic laminated, look like they could resist liquids so long as its not dripped on the edge of the card. the problem I had with them is the backs. I would like them better with just a generic playing card back, not the "spotter plane cards" tan back. its not a big problem. but the planes on the cards are done well, I feel I'm looking at a spotter chart from WWII Destroyer when I see them. they're very well done. A great set of playing cards. American, British, Japanese, Italian, and German airplanes.